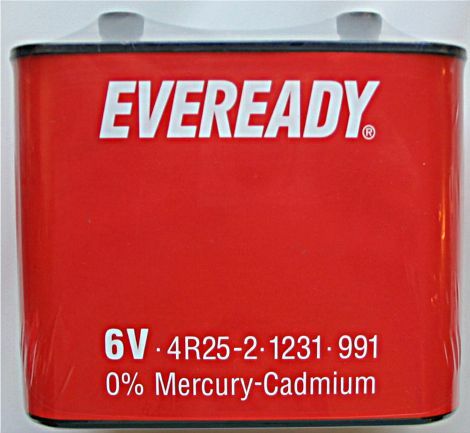 4R25-2 / 991 6V Lantern Battery with screw connectiors. Price: £13.99 each. Postage and packing included. Also known as: 991, PJ991, 1231, 918A, 918D, 918G, 918CD, PC918, 4R25-2C, 4R25-2P, Big Lantern, Double Lantern, EV131, Lantern 6V (Big), MN918. This zinc chloride 4R25-2 (991) has two protruded screw terminal connections and is commonly used in torches, lanterns and flashlights. The 4R25-2 (991) is also used in the construction industry to power flashing lights and other lights.